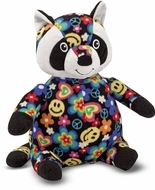 Beeposh Razzle Raccoon's bold print features a blast of colorful hearts, flowers and smiley faces against a rich black background. Razzle is made of soft, squishy fill and ultra-soft fleece . . . so he gives the warmest of hugs with a super-cool edge! Item dimensions: 15 x 9 x 9.